Don’t feel guilty for taking a family camping trip during the school year. Too much traffic, booked-out far in advance, expensive holidays aren’t for everyone! Combining some good quality fun with educational opportunities is always a win-win situation while the rest of the kids are in school! Here are some tips for making your holiday healthy and educational while the kids are missing out on studies. Besides, experience is the best way to learn! Camping is the greatest science lesson. Nature is all around you. Biology, geology, astronomy, meteorology, these are just a few of the areas you can explore with the kids. Flora: gather different plants, flowers, seeds and teach the kids how to identify and learn about them. Fauna: land and sea animals are fascinating. Take photos of all the animals you find and discover their habitats, anatomy and what makes them unique. We also love collecting skulls and bones! Look up at the stars. Use an app to point out constellations and the phases of the moon. Find a shooting star and celebrate the night sky. Cool rocks. We have a habit of collecting interesting rocks. Learn about how they were formed, what makes them special and bring them home if you like natural paperweights or want to decorate the garden. They are the best souvenirs. Clouds, sky and sun. Track the weather, learn about the wind and watch the radar. There is nothing more fascinating than tracking a storm or explaining how the tides work to a five-year old! Learn about the water cycle first hand! History is a fascinating tale and always present, no matter if there are signs indicating what happened at a place or not. Long before the wandering swagman, dinosaurs occupied Australia and Aboriginals hunted kangaroos. Look up the story of the places you visit before you leave so you can have a good idea of what happened there. Always stop in local museums, libraries and information centres to learn about the people and past events. Encourage your kids to be curious and let them ask questions. The land tells stories—learn to listen to it! Maps and GPS technology are the perfect geography tools! My kids love to watch Google Maps navigate us through the city and use the Hema Maps app to travel the dirt tracks. Bring along paper maps as well so they can understand and see the entire route. Point out landmarks on the map such as mountains, rivers, rock formations, wetlands and the coastline. Teach them how to navigate, east, west, north and south, as well as how to use a compass. We live overly structured lives, running from home to school and work, to sport to home and back again with video games and iPads in between. I realised, as you may have, there is not enough time for free play and imagination training in our daily lives. Going offroad and setting up camp is sensual immersion. There is nothing holding back nature, it’s there in full view! Take the electronic devices away and let the kids learn how to play again. It might take a few days for them to detox, but I find by day three they are used to life without interference. The term nature deficit disorder was coined in a 2005 book by Richard Louv titled Last Child in the Woods. He spent ten years traveling around the USA interviewing parents and children, in both rural and urban areas, about their experiences in nature. He argues that media coverage and paranoid parents have literally scared children out of nature, while promoting a culture of fear that favors regimented sports over imaginative play. Studies by researchers throughout the world suggest physical activity and exposure to nature are important for good physical and mental health and wellbeing, and can reduce sadness and negative emotions. Mindfulness is all the rage. Teach your kids and yourself how to do it while you are calmly camped somewhere peaceful. Mindfulness is all about the senses. Ask your kids to list what they hear, see, smell, taste, and feel (touch). This will help them tune into to their environment. Mindfulness is best practiced upon waking to set the tone during the day. Ask your children to focus and count their breaths to 20. Let their minds wander freely—encourage quiet play such as puzzles and drawing and relaxation. Keep it short, this practice doesn’t have to be long (5 minutes). If the kids catch on, move into meditation! Most schools don’t mind if you miss out on class time, but it’s a good idea to have the kids document their trip. Ask them to use photography, journal writing, poems, art and other types of self-expression to describe their journey. Ask them to express how the trip makes them feel—especially visiting different locations and learning about the history (sometimes this can be sad). Self-expression projects are a great way to keep teachers happy and the educational goal at the forefront. Plus, when they get back home, they can show the other kids everything they learned! Hunting, fishing, gathering—long before supermarkets and microwaves, this was our way of life. How long could your family survive in the wilderness? Even if this isn’t realistic, it’s still a fun game to play with the kids. Ask the, “if you were lost in the bush without a mobile reception, what would you do?” question and see where it goes. Knowing how to respond to emergencies are not only great skills for children to have, but also adults. First Aid knowledge, as well as a general idea of what to do for snakebites, sunburns, wounds and infections can also be incorporated into these lessons. Depending on where you go, there are specific rules for surviving vehicle breakdowns (in the desert, stay with your vehicle, etc), calling emergency (UHF radios, satellite phones) and other dangerous situations (CPR, trauma). Always bring a first aid kit and make sure everyone knows where it is stored! Taking a trip requires a lot of planning and when executed well, help from everyone. Get your kids involved from the very start with the planning process, show them how to write a list, plan your route, calculate driving distances and time, develop an itinerary, and pack for the trip. When you’re on the road and camped, give them certain responsibilities such as washing dishes or sweeping the tent so they understand that holidays require cooperation too. It’s important to take children out of their comfort zones and expose them to new places, people and experiences. Putting them in unfamiliar situations allows them to grow and evolve and develop hands-on experience for dealing with new challenges and perspectives. Overcoming fear is one of the greatest life lessons—once children realise the only thing holding them back is themselves, they can take risks later that may benefit their lives. 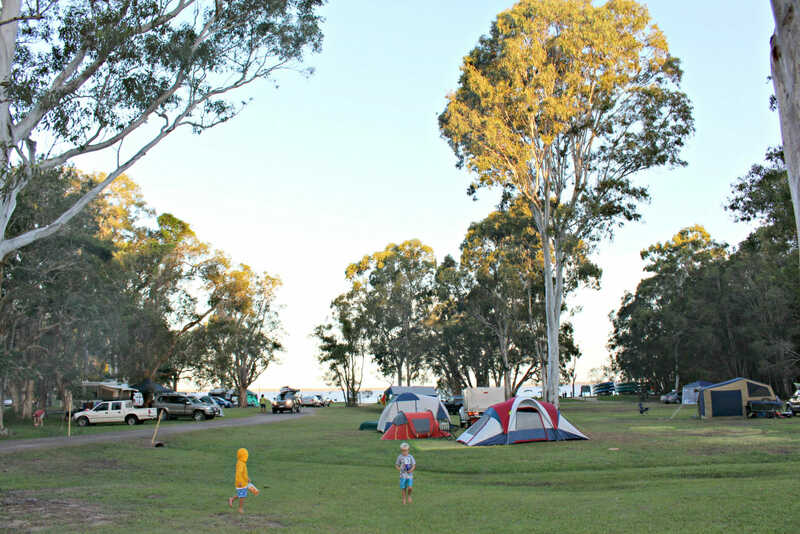 The best thing about camping is the fact that your children will meet other children and spend most their time playing! Not only does this give the parents more leisure time, it also creates opportunities for your kids to meet other kids from all over the country. It’s important to develop social skills and to learn early on that we are all much more alike than we are different. After your trip, ask the kids to write or draw their experience. It’s always interesting to find out exactly what your children remember from the journey even if they’ve only been home for a few days. Certain events and experiences will stand out which can give you a good idea of how they perceive events. Holidays can change a person’s life forever—how many people have you met who moved to the Sunshine Coast because they came here with their family as a kid!